Hialeah Accountant Contact Page Best Service for your needs. Hialeah Accountant Contact page is produced by Corey & Associates Accounting Services. This firm has been assisting their client with all of their accounting needs since 1985. Did you get an IRS Audit Letter? Spend much time doing bookkeeping. Do know whom to trust to preparer a tax return? Got late fines for not knowing when to send it the forms to the Government. We have the answer for you. Corey & Associates Accountant Services has been assisting Clients since 1985. This firm prepares tax returns and opens your business in as little as 15 minutes. Provided accounting and bookkeeping services in addition at the best prices in town. 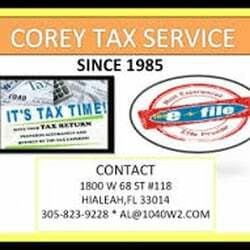 Corey & Associates has been in the Hialeah Accountant Services since 1985. They have the same phone number 305-823-9228 for over 25 years and on the same street since 1993. Since 1990 have been an IRS E-File Provider. This Hialeah Accountant firm will get you the best tax return without an Internal Revenue Letter. Finally, our motto to get you the best return without getting a letter from the Tax agency. All Federal State and Local return are filed in our office with all the updates to get you the best tax return. Need a Corporation or LLC open and did you know we can start your business in as little as 15 minutes. Hialeah Accountant furthermore we have the knowledge and experiences to make sure you have no tax issues. Prices are so reasonable and why not let an expert do the work for you. Would you cure your self if you need surgery? Having Issues with the IRS or Florida Department of Revenue. Your paying lot of Fines for not having your forms filed or on time. We can solve this issue for you. Corey Tax can assist you. Our staff has the knowledge and experience to answer all of your payroll and bookkeeping. Our office is located at 1800 W 68 St Suite 118, Hialeah Florida. Just Minutes away from anywhere in Miami Dade, Miami Lakes, Miami Springs, Hialeah, Hialeah Gardens, Miami Lakes and Miami Gardens. Right off the NW 122 exit of 826. The phone number is 305-823-9228 and our email albert@1040w2.com. Free 15 Consultation. Like Us on Facebook.Com/1040w2 for daily updates on tax and accounting issues that could affect you. Also, our Youtube Channel has business tips that are very useful. Fax and email and email services are available if you can not come to the office. In conclusion, If you are in the area, please come by the office for a free 30-minute consultation.